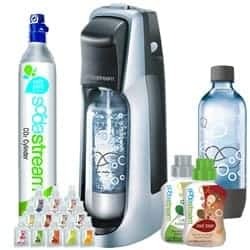 Sammi’s Blog Of Life is giving away a Sodastream maker plus 8 bottles of assorted soda mix and 3 mini bottles of concentrated mix. The rules for the contest are whoever refers the most people to her blog wins! The minimum amount of followers you must get is 4 to be considered entered into the contest. Tell your friends, family members, co-workers, and whoever else you know to follow Sammi’s Blog Of Life. Tweet the giveaway, post on Facebook, email friends, post on your site and be sure to tell people who follow to say that you sent them over! Send Sammi an email to let her know that you referred a person who is now following her site. She will be updating the giveaway post each day to show the progress of how many people everyone has referred. The giveaway is open to US only and ends on 4/15. Visit Sammi’s Blog Of Life to enter the giveaway. I’ve put you down as my reference to Follow Sammi’s Blog of Life …I’ve subscribed to her email & am following on FB & Twtter & GFC Good Luck! !